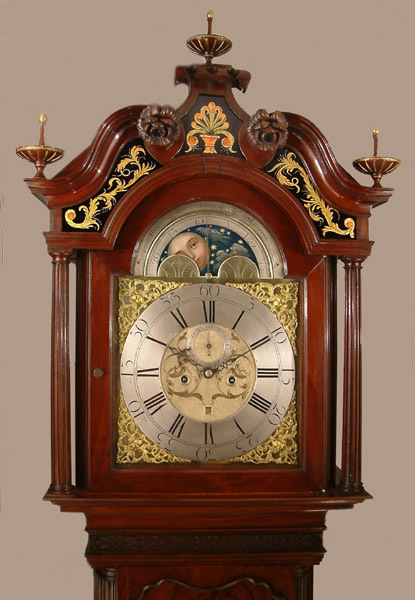 Isaac Young of Liverpool Longcase Mahogany Circa 1765 - Height 101in. This Longcase Mahogany's Maker - Isaac Young of Liverpool is recorded died in 1768 . 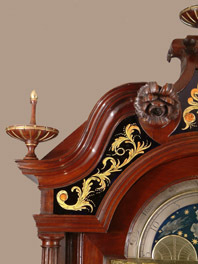 Substantial, well proportioned, long door flame mahogany case with swan neck pediment having verre eglomise panels under, pierced fret under throat moulding, reeded hood columns, matching trunk quarter columns, canted corners to book match veneered base and shallow ogee bracket feet.Typical "flying saucer" finials. 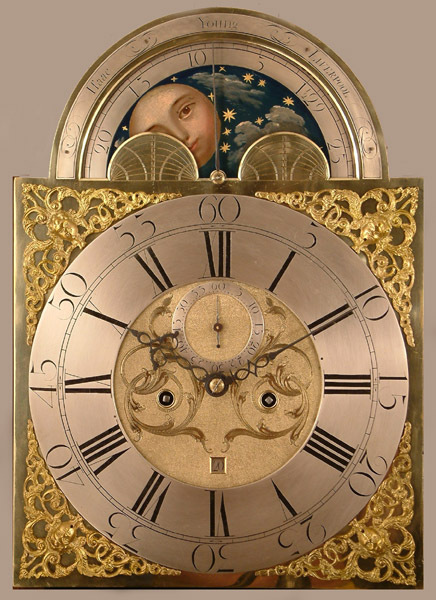 13" breakarch brass dial with moonphases to arch, subsidiary seconds dial, box date aperture, finely engraved and matted dial centre, cherubs head spandrels. Name engraved in "rainbow" over top of dial arch.Blued cut steel hands. N.B. The moonphase disc features a cloudy, starry sky background which, in my experience, is quite unusual. Isaac Young of Liverpool is recorded died in 1768 . Dating by style circa 1765. 101" ( 256.5 cms. ) or 96" ( 244 cms. ) ex. finials.